2006 was an amazing year for us. That was the year we got to know Hung, Lung, Chor Pat and Tung and the rest of the Dawn Team. It was the year that opened our eyes to a side of Hong Kong we never thought existed. 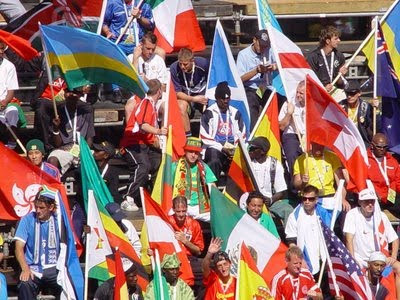 It was the year we journeyed to South Africa for the Homeless World Cup. A year in which we made new friends, rethought old stereotypes and grew up just a little bit more. We never fully comprehended the meaning of urban poverty until we hung out with the Dawn Team. Yes, our experiences in East Timor and Cambodia showed us what it meant to live desperate lives. But being poor and hungry in a city of plenty is somehow, an uglier, sadder thing. 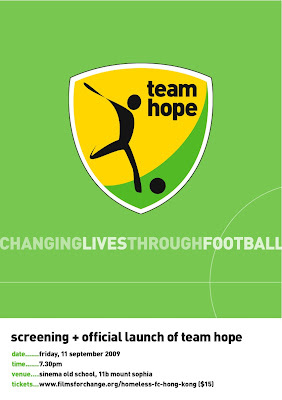 Which is why we are thrilled to introduce Team Hope – Singapore’s very own football team for the homeless and disadvantaged. Homeless people in Singapore? Yes, they exist. Look a little closer and you’ll see them. Some have slept on the streets for years. But a large number have been booted out of their homes because of the economic crisis. Others, like some of the men from the Dawn Team, are ex-addicts and offenders hoping to turn over a new leaf. Many end up in one of the shelters run by New Hope Community Services. Over the past two months, a group of volunteers from New Hope has worked hard to lay the groundwork for Team Hope. The motto – Changing Lives Through Football. The aim – to give those living in New Hope’s shelters a team to call their own. We’re not just targeting men, but entire families. We want to create a dedicated time each week where parents can do something fun and healthy with their children, siblings can bond, frayed ties can perhaps heal. And what about those without families? They get to join a community, play a sport, learn discipline, build a healthier body, gain a bit of self-confidence, and perhaps as a result, start to reintegrate into society. We sometimes get emails about Homeless FC. A large number of you ask after Wai Tung, the social worker in charge of the Dawn Team. You tell us how you much you admire him for his dedication. You want to know how he manages to do what he does. If you’re Singaporean or live in Singapore, this is your chance to make a difference, the way Wai Tung did. Support Team Hope. Find out more at our charity screening on the 11th of September (to enlarge the image, click on it). Buy tickets here. All proceeds go towards Team Hope. The screening is being presented as part of Sinema’s Social Film Festival. Check out the festival’s impressive line-up here.